This year the PCN sponsored the Broads Awards for Most Smoker Friendly Pub which was won by the New Inn, Horning. No pics of this I'm afraid. 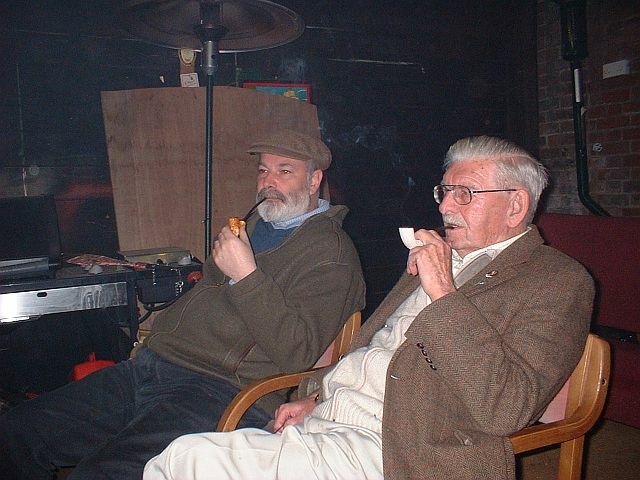 Frank Gurney-Smith won the star prize of a lovely Peterson pipe. In all there were about 50 prizes with Keith Coleman doing very well for a change. The usual massive attacks of indigestion followed the annual cheese and pickles evening. Cheese from Norwich market and pickles from all over the place made for a most enjoyable repast. 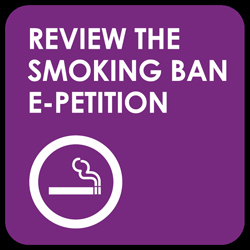 Brian Mills is trying to resurrect the Federation, which has fallen by the wayside since the smoking ban. It appears that, along with PCN, there are clubs in London, Edinburgh, Nottingham, John Hollingsworth, South-west and The Forum. I notice that this year's World Championship took place in Eindhoven: a well-kept secret. 'Question: is a bar or pub or restaurant 'a workplace?' Yes, it is, in a way, obviously, because people have jobs there. But is this not a slightly reductionist definition of a place of hospitality? You as a customer or patron do not have quite the same relationship to the management as you do, say, to those from whom you buy your groceries. When you enter your local, you are a guest and the proprietor is the host. Much depends on an atmosphere of mutual cordiality. Well, then, if the owner likes his pipe and you enjoy the odd cigarette or cigar, why should anyone else be involved in the relationship? Those who do not want to be around any smoke have plenty of places of their own to which to resort, where the rules are different. Congrats to Reg who won the annual darts in a play-off against Len. The October General knowledge quiz was won by John Walker who was given a bottle of vino kindly donated by John Eason. The Secretary's general knowledge quiz was won by John Walker in a photo-finish with John Eason. 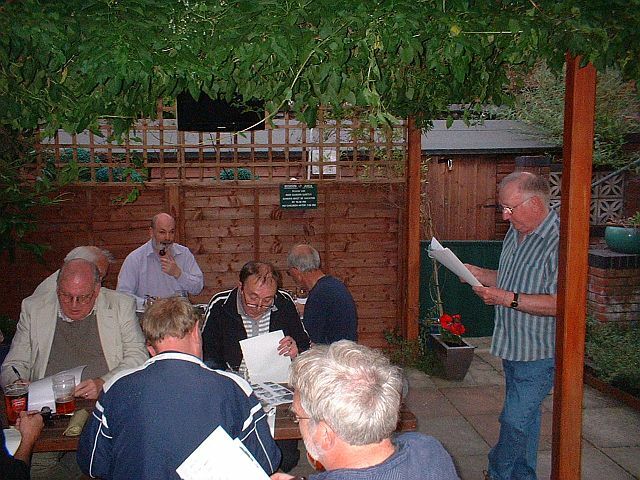 The Secretary was unable to attend, and Tony Larner did an excellent job as replacement quizmaster. PCN sponsored the annual Broads Awards prize for the pub offering the best smoking facilities. The presentation evening was held in Horning, but unfortunately no member was available to present the prize, which was won by the New Inn, Horning. Perhaps if we sponsor next year's award we should first make sure that someone is able to represent the Club. 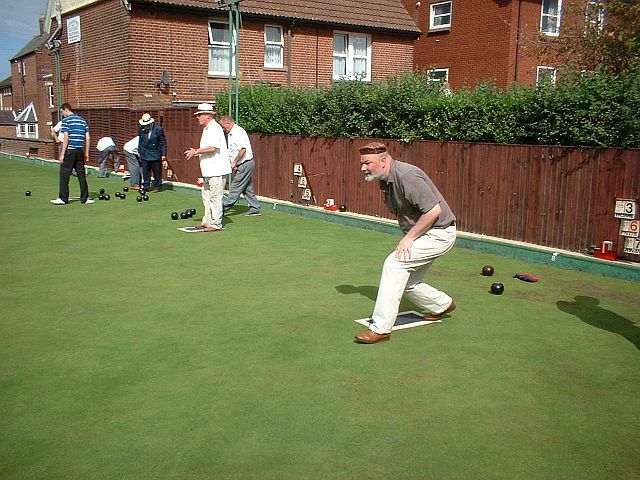 The annual clay competition was won by David Wollard-Kingston who ended spitting ash after 52 minutes. John Walker was second. 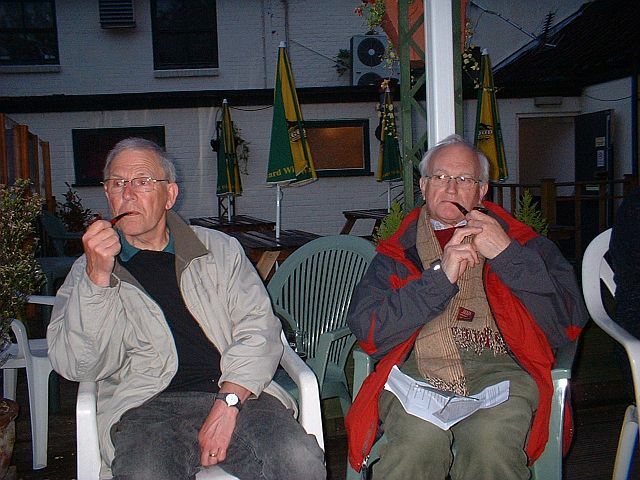 The annual clay pipe smoking contest was won by David Woolard-Kingston with a time of 52'45. John Walker was runner-up in a contest where three grams of Highland Whisky was smoked in various clay pipes. 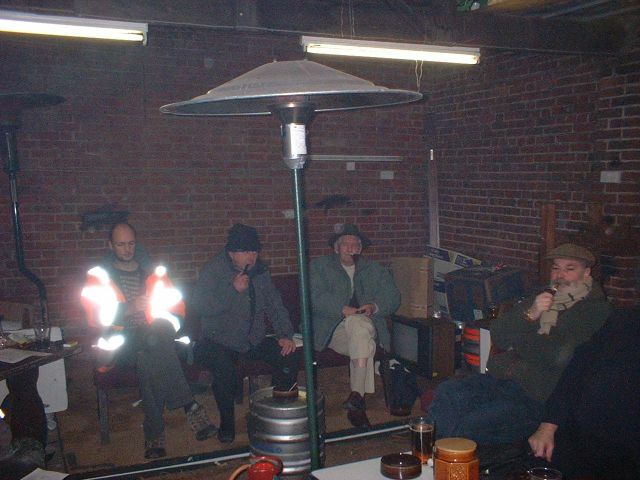 The winner was presented with a packet of Borkum Riff and an Imco lighter. Coincidentally a clipping from the Eastern Evening News dated 24 February 1983 has fallen out of the file. 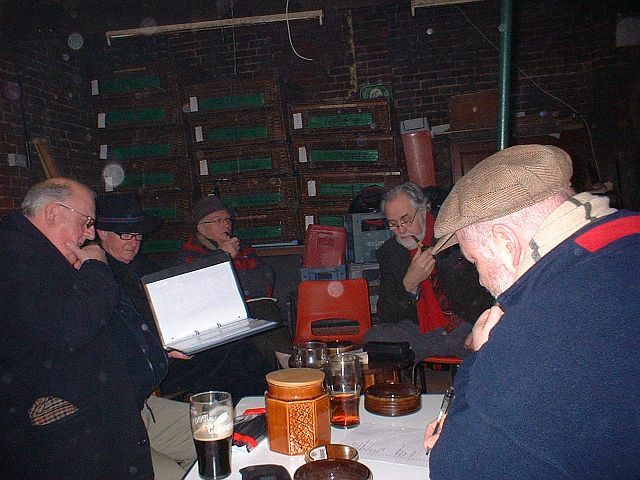 Reporter Carole Bailey attended our meeting at the Coach and Horses, Thorpe Road, where they photographed Messrs Ellis, Struthers, Palmer, Bennett, Phil and ray Lewis, and Walker: all sporting clay Churchwardens. Len was celebrating the 97 minutes he achieved at the annual RAFA contest. We managed to raise �25 in the auction. The market for crap exquisite collectibles is a bit slow this year. The annual auction, and not many lots this year. Perhaps people are running out of rubbish, or perhaps all the rubbish has by now circulated to all the members. John Walker did an excellent job as auctioneer, and £25.15 was raised. The duck and orange pate was delicious. 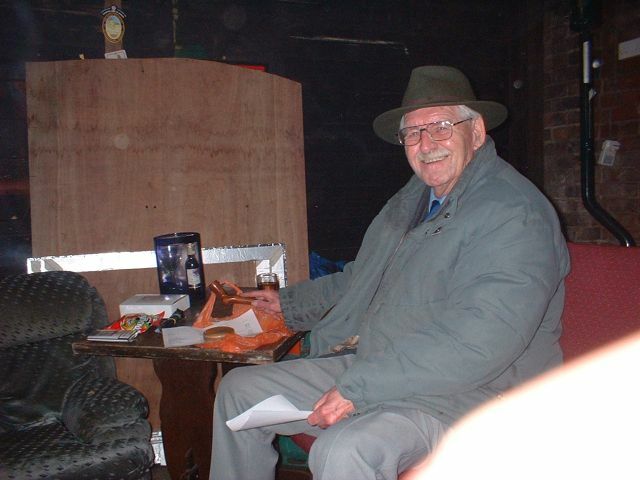 Reg Walker won Old Smokey's Quiz. 1. Which author did Kipling never expect to meet? 2. What can be the death of a dwarf and the last page of a fairy tale? 3. New Orleans in Italy? 4. George O'Brien was a five times winning owner, he first made a killing in 1792. He was the third what? 5. You could get a jar if you used this revolver. 6. In which film did Tom Ewell have Chicken Pox for 2,556 days? 7. In golf if 2 is Pink and 8 is Yellow, what colour is 12? 8. Starts to serve time in Russian prison. 9. What connects Mary Todd (1861), Lucretia (1881), Ida (1897) and Jaqueline (1961)? 10. Was it spent by Buffalo Bill? Answers to Keith by November meeting. 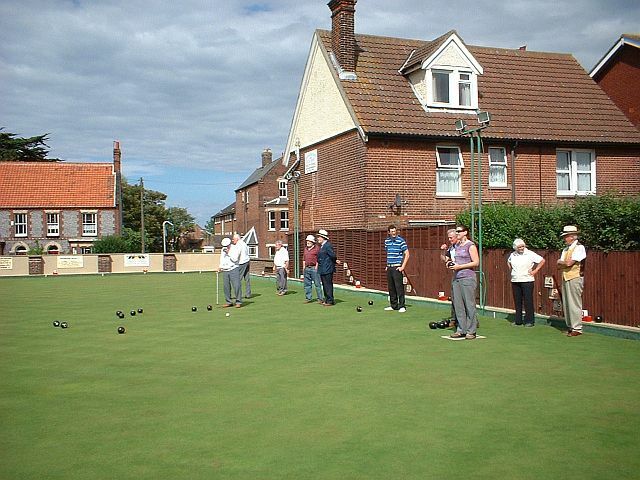 Thanks to Tony for organising another excellent bowls afternoon with our friends at the Morley Club in Sheringham. Len won the annual 3grams outdoor competition. The 5th. 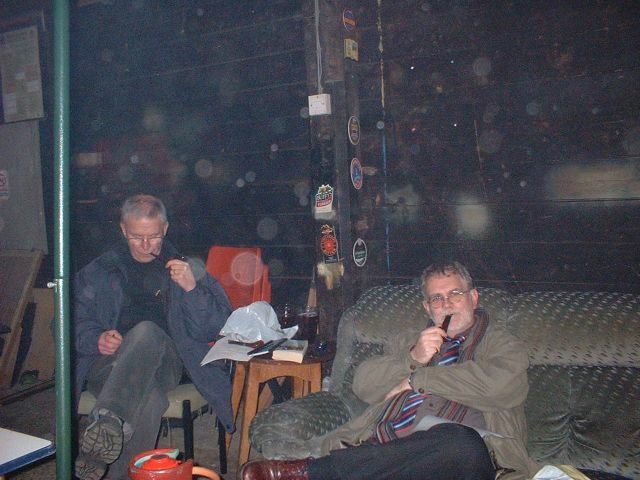 annual outdoor smoking contest (is it really that long since the smoking ban?) took place in the gardens of the Nelson. 3grs. of MacBaren Roll Cake was smoked in pipes of the contestant's choice. The evening was fine with very little wind but produced the worst times ever, although everybody had valid excuses. 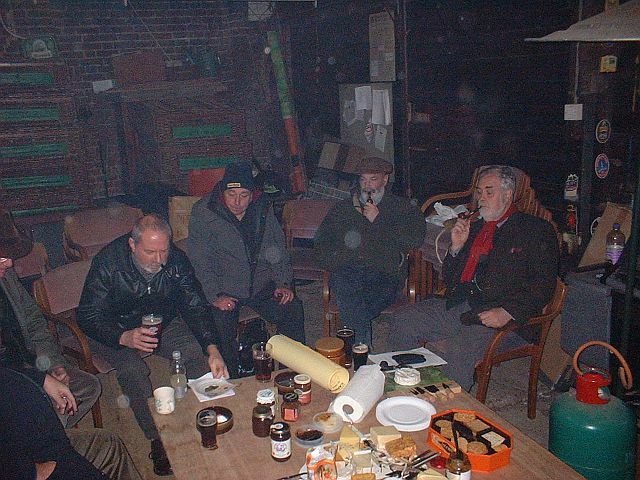 First out was Frank Gurney-Smith after only 4 minutes (busy looking for bats), he was followed by Keith Garrard in 8:20 (fishing a fly out of his beer), John Walker 12:05 (busy taking photos), John Betts 19:25 (talking too much) and Keith Coleman 27:10 (pipe fell out of mouth). There were joint runners up David Woollard-Kingston and Tony Larner in 32:45 leaving Len Ellis as the winner with a time of 37:00. 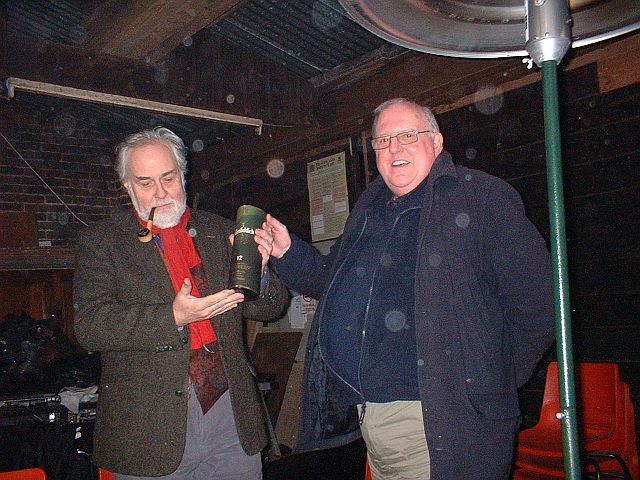 Len was presented with a Comoy pipe, a raffle was held in which Tony Larner won first prize. 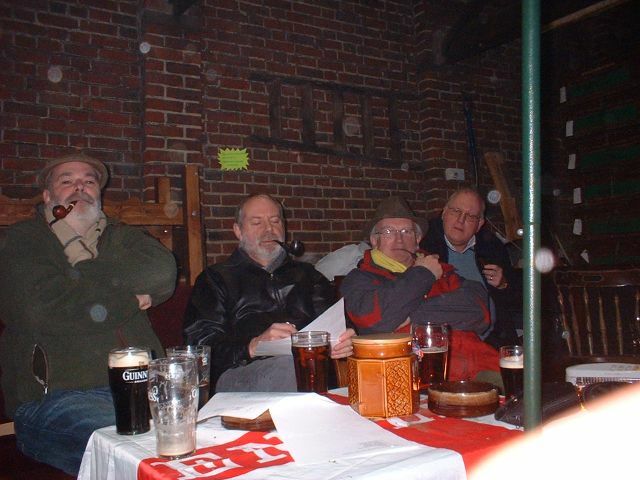 Many thanks to Ronnie Bobbin for an excellent picture quiz which took place at the Jubilee pub. John Eason won on a tie-break with Frank King Junior. 1. Who was British Prime Minister at the time of the Peterloo Massacre? 2. How was Saloth Sar better known? 3. What is the nationality of the author of the 2008 work The Meerkats? 4. Which club was formed in 1878 and frequently met at the Blue Post pub in Oxford Street, London? 5. Who married dancer Mayte Garcia on Valentine's Day 1996? 6. Lum is the Scottish name for what? 7. The 1989 World Under 21 Snooker champion was born in which city? 8. Jonathan, King David and Alexander are types of which fruit? 9. The city of Velikiye Luki stands on which river? 10. What connects the answers to the above nine questions? Answers, please, by 31 July (Old Smokey's birthday, hint hint) to Keith. 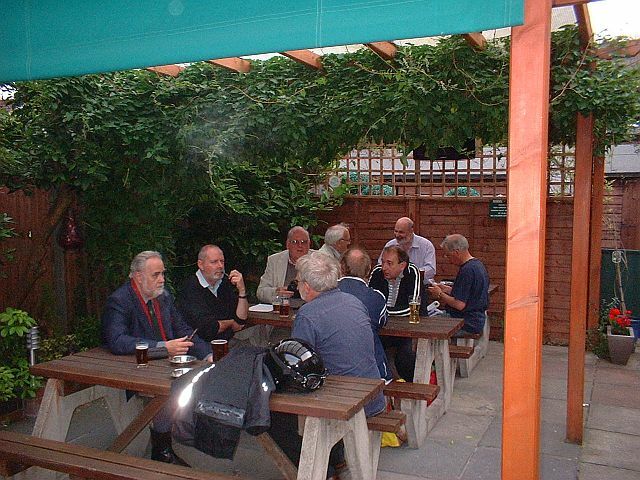 On a lovely summer's evening the meeting was held in the gardens of the Jubilee in Thorpe Hamlet. 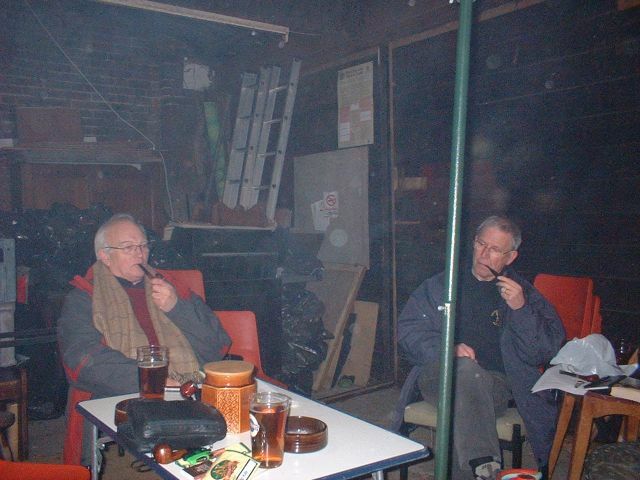 A good turnout, including a guest appearance from Frank King Jnr., gathered for Ronnie Bobbins� famous pipesmokers� quiz. 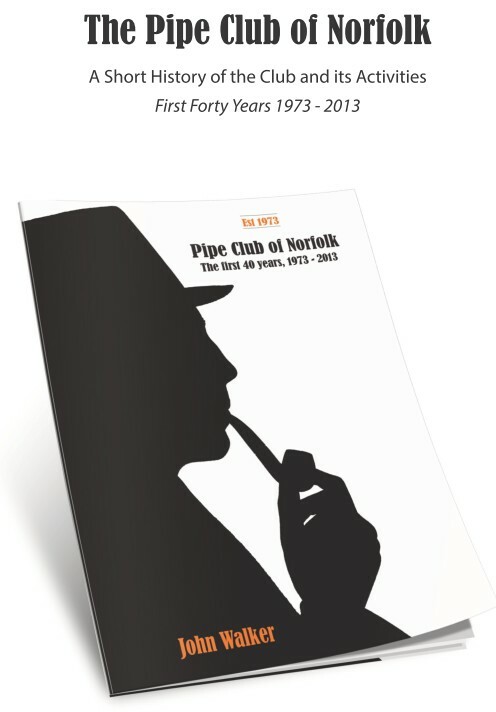 With pictures of famous pipesmokers accompanied by a question relating to each one there were 50 points up for grabs, there was a draw for first place between John Eason and Frank King, John winning on the tie break question. Good beer good company and nice surroundings this was a very successful meeting. We had to relocate for a fun 4 grams outdoor smoking competition which was won easily by David who seems to have a knack when it comes to the 4 grams. Unfortunately the Nelson, our headquarters, closed three days before the scheduled meeting. 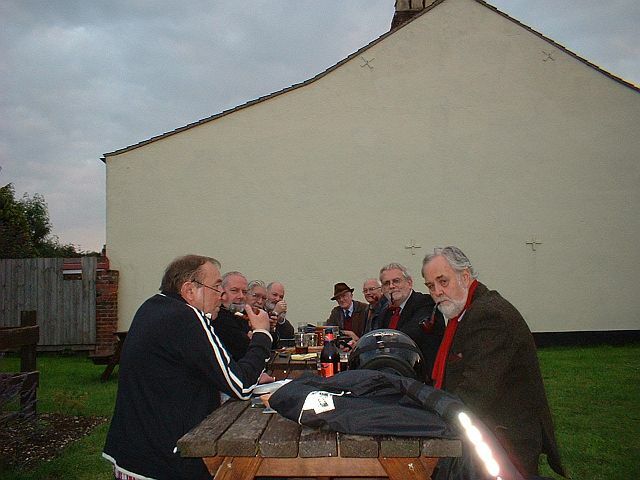 Hasty arrangements were made and a meeting, attended by seven members, was held in the outdoor smoking area at the Reindeer. This was a 4gr. smoking contest which was won by David Woolard-Kingston with 70'03. John Betts was runner-up with 58'35 and John Walker won the raffle. 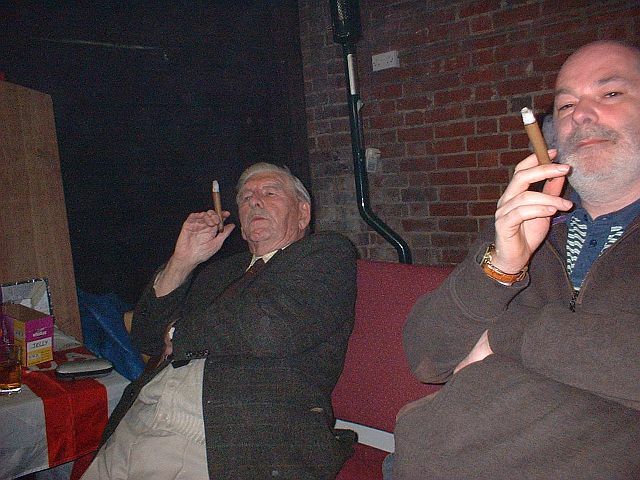 Annual fun cigar smoking competition to see who can produce the longest ash. 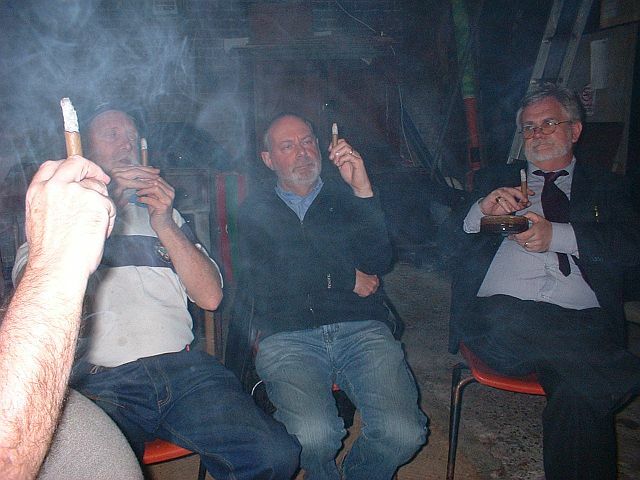 On a mild spring evening the club's daftest competition took place, the annual cigar smoking contest. The object is to obtain the longest ash, Keith Coleman was dashing madly about with his hi-tech measuring instrument as contestants held their erections up high. 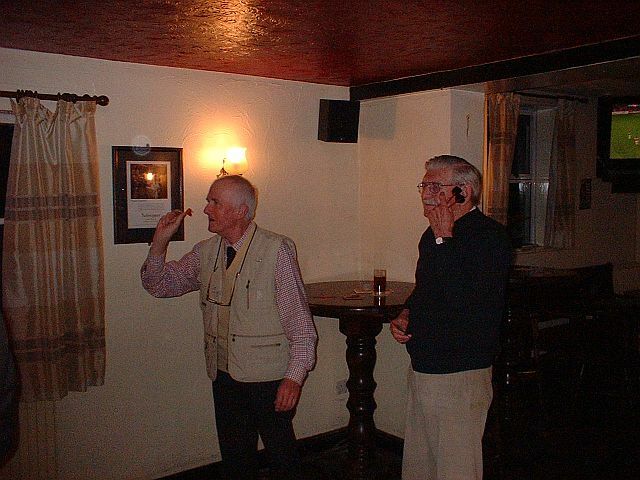 John Eason was the first to lose his as a cloud of ash filled the room, the winner was Tony Larner with 2.9 somethings closely followed by David and Don. 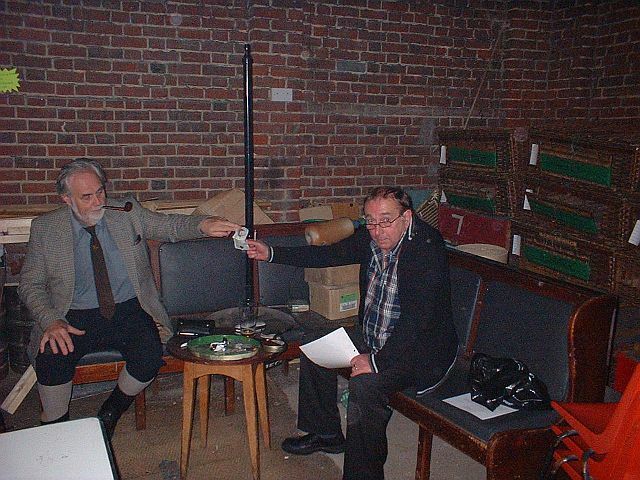 A raffle was held which included Easter eggs, tobacco, a mystery prize and the left over cigars. Excellent quiz set by John Eason and won on a tie-break by Keith Coleman who now has to set the next quiz. The meeting opened with a whip-round to purchase a diary for one of our younger members, with the third Wednesday of each month clearly marked. We will say no more than that due to this Bookmaker's dilemma (all Betts being off) the Secretary also suffered an enforced absence from The Quiz of the Year. John Eason strained his last braincell (just as well he was sitting on a Lords' Cricket Cushion given to him by one crawling contestant- much good did it do him) and the contestants scratched their thinking parts. 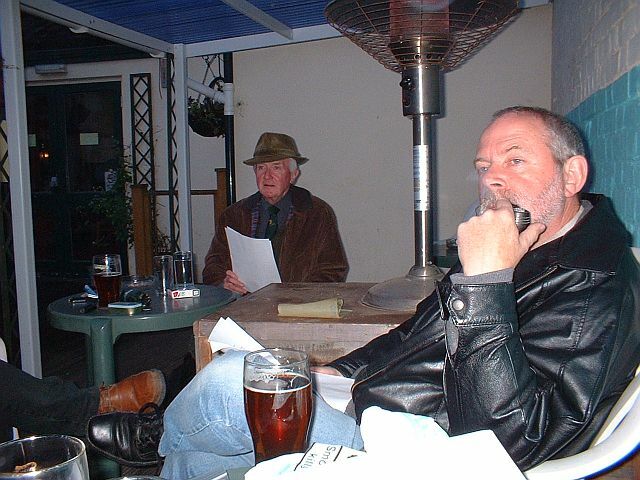 Topics ranging from Dead Poets' Dogs, Television Programmes, Chefs, Football, Bridges (and other composers), Men with Curious Appendages, Local Knowledge and, yes, even Smoking tumbled from the Questionmaster's lips....resulting in a nail-biting tie between John 'No Television' Walker and KJ 'No Computer' Coleman. Breath was held.....the question asked.....and if Wagner had come to JW's aid it may have necessitated a double-tiebreak (known as a Cravat Break in the trade) but KJ pipped him and the bottle of fine Scotch Malt was his. Well done JHE...you can rest on your cushion for another year. Following the article in the Winter newsletter our member in Aldridge, David Bates, has supplied us with the following suggestions: Gideon of the Yard, in the film portrayed by Jack Hawkins. Wayland Smith, nemesis of Fu Manchu in the Sax Rohmer novels. Father Brown in the stories by G.K. Chesterton, played on TV by Kenneth More. D.S. Fitzgerald in the story "The Ambulance Made Two Trips" by Murray Leinster. Rip Kirby "The Debonair Detective" in the American Comic Strip series by Alec Raymond. Patrick McGoohan in Danger Man also smoked a pipe. C.I. Alec Fletcher , husband of Daisy Dalrymple in the novels of this lady amateur sleuth by Carola Dunn. Commissioner Claude Lebel in The Day of the Jackal, played by Michael Lonsdale. C.I. Littlejohn by George Bellairs and Solar Pons in the books by August �Derletus. Anyone got any more? Well done to Len Ellis who won this year's 3 grams competition and commiserations to runner-up Tony who missed out on the treble. We welcomed Stuart who came along to have a look and see what we get up to. Looks as though he works at Sizewell B. Thanks to John Eason who provided a cornucopia of prizes for the raffle. Funny how the secretary managed to win a nice box of chocs. 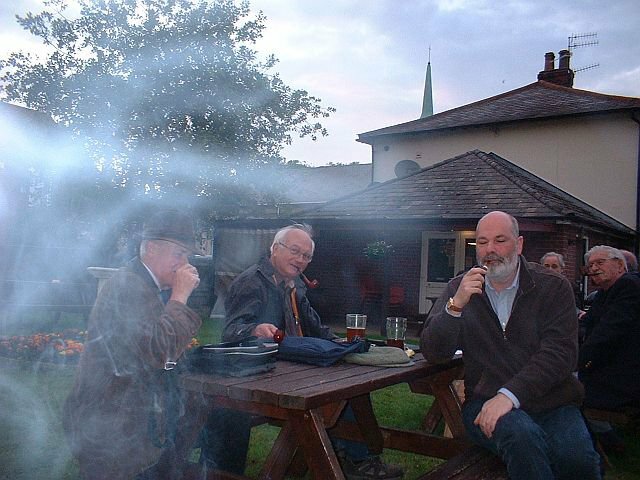 The annual briar smoking competition, using 3grs. of Gawith Hoggarth's Bosun Cut Plug. 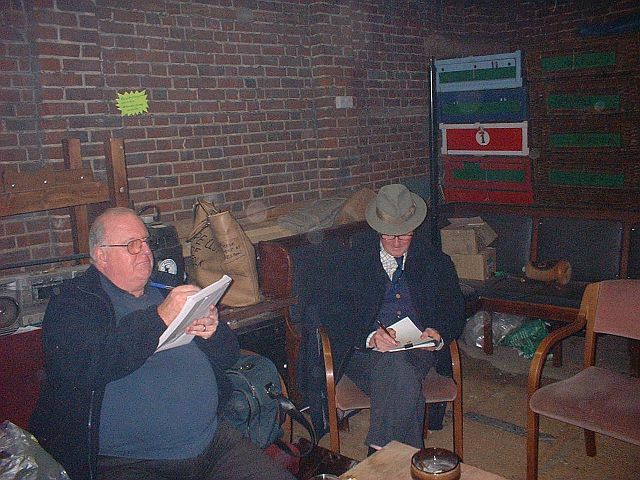 In previous contests, including the Norfolk Pipesmoking Championship, this tobacco had produced some good times but not on this occasion as 50% of the contestants were gone in under 15 minutes. When Tony Larner �was out after 38:28 it only left (guess who?) Len Ellis, who went on to achieve 53:35. 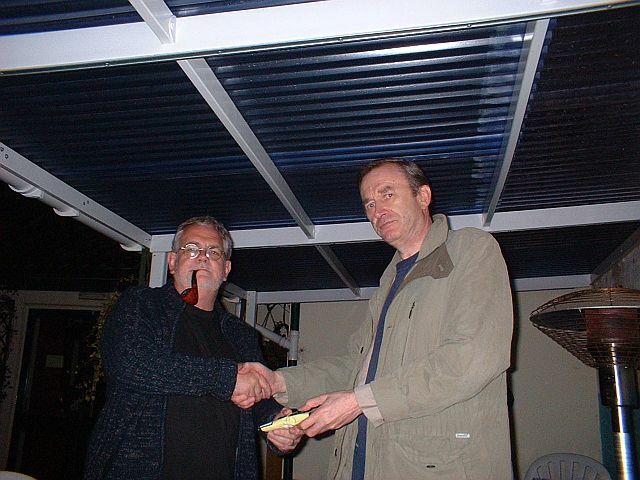 The winner was presented with a Parker pipe. Our thanks go to John Eason who donated the excellent raffle prizes (an improvement on the usual rubbish supplied by the Secretary). Sandwiches were enjoyed to round off an enjoyable evening. A good turnout- a dozen, in fact- for the Annual General Meeting in Nelson's Hold: not as cold as it has been. There were no apologies for absence....the minutes of the previous AGM were read and accepted as a true copy.....the Chairman thanked the staff at the Nelson and said that it had been a quiet year but thanked the members for attending on a regular basis. The Auditor gave his report and after ironing out a small problem it is clear that Club finances are very healthy. In the election of officers the vice chairman stood down and John Walker was elected to the post. All other officers were re-elected: Chairman Len Ellis, Secretary/Treasurer Keith Garrard and Auditor Keith Coleman. Subscriptions were paid (including from sporadic visitor, Don Warman). The meeting closed at 8.35pm. 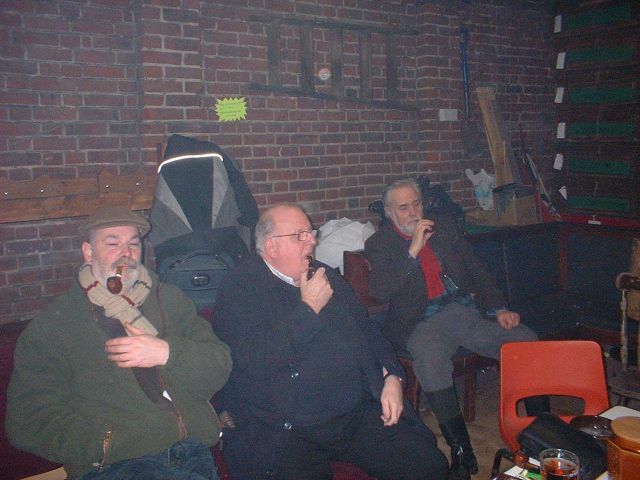 Wednesday 16 February: the annual briar smoking competition. 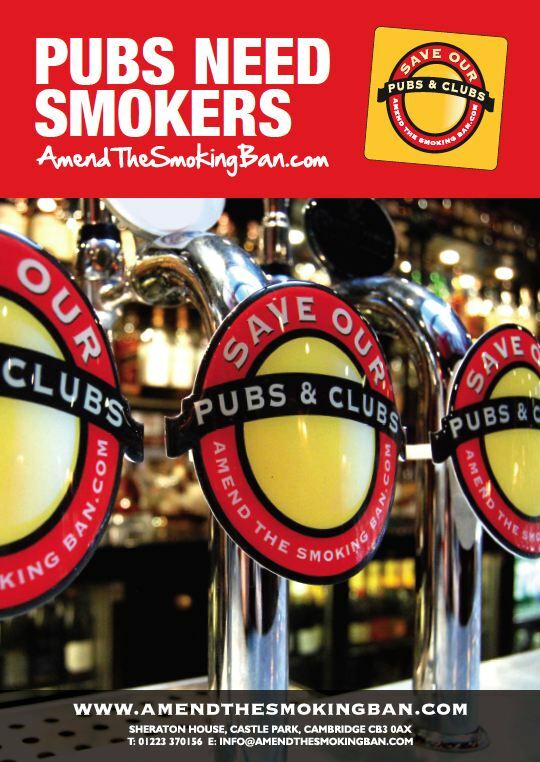 Wednesday 16 March: John Eason's fabulous quiz + a tobacco sampling. 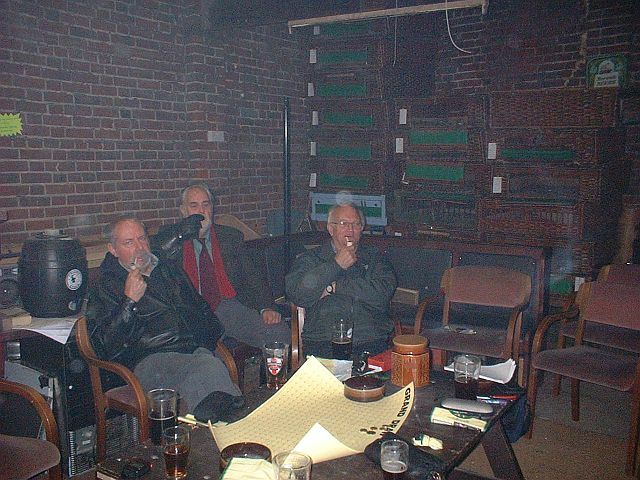 Wednesday 20 April : a cigar smoking competition. 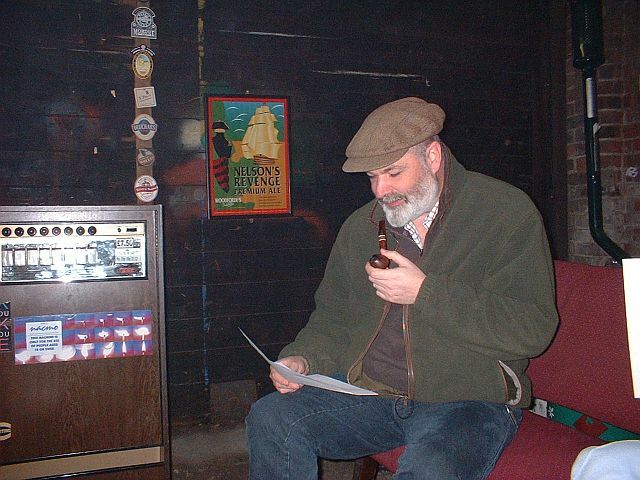 Wednesday 15 June : welcome return of Ronnie Bobbin with his ever popular famous pipesmokers quiz. Wednesday 20 July: the outdoor smoking contest in the glorious summer sun. The other feature of the meeting was a tobacco sampling, Gawith Hoggarth TT Ltd. had kindly sent us a selection of flakes, these included Cherry Cream, Bob's Chocolate, Glengarry and Grasmere. The latter appeared to be too scented for most members, the chocolate one was liked by some but the most popular by a clear margin was Glengarry. We all know about Sherlock Holmes, creator Sir Arthur Conan Doyle was a pipe smoker, but how many other detectives can you name. There is of course "Maigret" the pipe smoking Belgian created by pipe smoker George Simenon. In the 1947 Edward Dmytryk directed film noir drama "Crossfire", Robert Young played the bland and benevolent pipe smoking Marcus Welby MD. Who remembers the BBC's "Fabian of the Yard" which ran from 1954 to 1956, it starred Bruce Seton as the pipe smoking Detective Inspector Robert Fabian and was based on the real life DI Robert Fabian. American TV show "Cannon" ran from 1971 to 1976 and starred William Conrad as an overweight PI with a love of good food and fine wine. Although Cannon was not a pipe smoker William Conrad certainly was and had a large collection of pipes. Probably the earliest literary detective is Inspector Bucket in Charles Dickens' novel "Bleak House", in early cartoons of the book the Inspector is seen smoking a clay pipe. 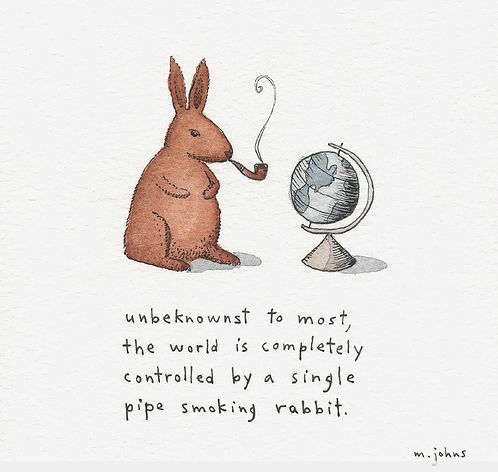 Do you know of any other pipe smoking detectives? If so please let me know.